Gujarat is known as much for its vibrant economy as for its ancient heritage. Consequently, few tourists think of boating when they choose Gujarat as their holiday destination. The fact is, Gujarat has huge water resources, which has been developed for boating and other aquatic sports. River Sabarmati and Kankaria Lake in Ahmedabad are just two of them. Indeed, Sabarmati Riverfront has now become one of the must visit places in Ahmedabad. Many residents of the town regularly come here for a walk. However, to enter the River Front area, one has to pay an entrance fee of Rs. 10. The recreational boating facility provided by the Riverfront authorities is also very popular. Anybody can hire a boat and enjoy a cruise along the river. Fees for the ride depend upon what kind of boat you choose. A motor boat ride will cost you Rs 20.00 per person per ride. However, if you are looking for speed boat or a pontoon boat, you will have to pay Rs. 100. 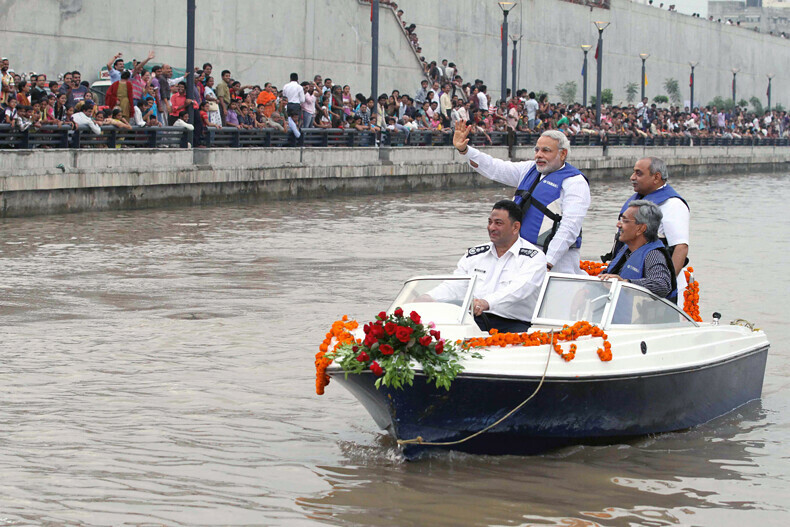 The boating service was inaugurated by the then Chief Minister Narendra Modi on 15th August, 2012. There are more than two dozen of boats, which cruise between Nehru Bridge and Gandhi Bridge. Three boating stations have so far been inaugurated. Among them, the first station is located on the eastern bank of Sabarmati River, close to the Subhash Bridge. The two other are located close to the Nehru Bridge and Sardar Bridge on the western bank of River Sabarmati. Boating facilities are available from 11:00 AM to 7:30 PM in summer 11:00 AM to 6:30 PM in winter. Sabarnmati Riverfront, a project developed by Sabarmati Riverfront Development Corporation Ltd, is situated in the Ahmedabad Municipal area on the bank of River Sabarmati. Although the main object of the project was to improve the environmental condition of the area and rehabilitate the people living along the river bank, reconnecting the citizens of Ahmedabad with their river has also been one of its priorities. Consequently, the project not only has a 10.4 km stretch of walkways built along the river bank, but there is also an excellent boating facility in place. Kankaria Lake is situated in the Maninagar area in the southern part of Ahmedabad. It is the biggest lake in the city and a hub of entertainment. Along with other attractions, the lake offers great scope for boating. While the entry fee for Kankaria Lake Front is Rs. 5 for children between 5 and 12, it is Rs.10 for visitors above that age group. If you want to avail boating facility you will have to pay Rs. 10 extra. There is no admission fee for children below five. Nal Sarovar Bird Sanctuary, located at a distance of 42.9 km from Sanand and 65.4 km from Ahmedabad, contains a huge lake covering an area of 123 sq km. While, this area is a favorite haunt of the bird watchers, the lake offers a great scope for boating. Boating in Nal Sarovar offers a truly awesome experience. In addition to the usual pleasure of boating, you get to see different species of birds from close quarters. However, to enter Nal Sarovar area, you need to pay a nominal entry fee of Rs.20. If you want to take your camera inside the sanctuary you need to pay an extra amount. In addition, you will be required to hire boats. The charge is around RS. 220 per person. While the lake is open for boating all through the day, if you intend to club bird watching with it you must either go early morning or in the evening after 4 PM. Sursagar Lake, also known as Chand Talao, is another ideal place for boating. This serene lake, with the statue of Lord Shiva located in the middle, is situated in the heart of Vadodara city and is known to contain water throughout the year. Moreover, in case the water level rises up to certain point, the water flows out through some submerged gates into the Vishvamitra River. This feature also makes it suitable for round the year boating. However, due a tragic accident in 1993, boating was temporarily suspended in Sursagar Lake. The Vadodara Municipal Commission has now decided to introduce this feature once again. However, they have enacted stringent rules so that the 1993 tragedy is not repeated. Saputara Lake, located in the Saputara Valley in the Dang district of Gujarat, is another great place to go for boating. This picturesque hill station has many attractions and boating in the Saputara Lake is the prime among them. Saputara Lake, with its crystal clear water, is surrounded by playgrounds, parks and gardens. In addition, there are various boating clubs located in the vicinity, from where you can hire boats. They mostly offer paddle boats, row boats and sail boats etc. The charge for the paddle boat is around Rs. 35.00 per half an hour. While, the facility is open throughout the year, August and September is the best time to visit the area; the nature looks best during this period and the lake also have enough water during this period. The timing for boating in Saputara Lake is from 10:30 AM to 5:00 PM.